The spinal column is one of the most important parts of the body, as it makes many different functions possible, including movement and balance. The spinal column also allows for upright posture, protection of the spinal cord and shock absorption. The spinal column and vertebrae are made of different elements, all of which protect the spinal cord while communicating with the brain. These elements also provide sensations through the body via a complex interaction of the bones, ligaments and muscle structures of the back and the nerves that surround it. The spine is composed of 33 bones, called vertebrae, divided into five sections: the cervical, thoracic, and lumbar spine sections, and the sacrum and coccyx bones. The cervical section of the spine is made up of the top seven vertebrae in the spine, C1 to C7, and is connected to the base of the skull. The top two vertebrae are also know as the atlas and axis, which form the joint for connecting the skull to the spine. The cervical section is responsible for mobility and normal functioning of the neck, as well as protection of the spinal cord, arteries and nerves that travel from the brain to the body. The thoracic section of the spine is located at chest level, between the cervical and lumbar vertebrae. The vertebrae in this section are labeled T1 to T12 and serve as attachments for the rib cage. 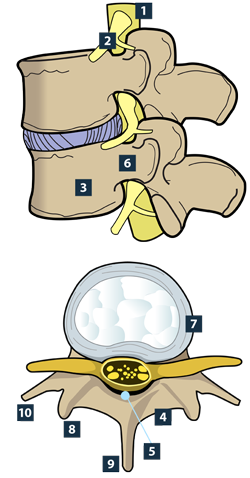 The lumbar section is located between the thoracic vertebrae and the sacrum. The five lumbar vertebrae, labeled L1 to L5, are the main weight-bearing section of the spinal column. The sacrum is the section located at the base of the spine. It does not have discs separating the vertebrae, because its five levels, S1 to S5, are fused together. The pelvis is connected to the spinal column at the sacrum section. The coccyx is at the very base of the spinal column and is made of four vertebrae that are fused together. The spine is normally a straight line when viewed from the back. If the spine curves to one side or the other, this indicates a condition named scoliosis. However, the spine does have some normal, gradual curves when viewed from the side. The neck and lumbar sections of the spine have a lordotic curve, which means that they curve inward. The thoracic spine has a kyphotic curve, which means that it curves outward. These spinal curves help maintain balance while upright and support the weight of the head and upper body. However, too much curvature may cause spinal imbalance, causing spinal conditions that may result in pain or loss of mobility. Normal adult spines are positioned over the pelvis, so upright posture doesn't strain muscles. However, changes of spinal position can stress muscles and cause spinal deformity. If the spine is injured and unable to function properly, it can be very painful or even disabling. The spine is made of many parts that protect the spinal cord, facilitate movement and support the body. The spinal cord has nerve pathways that carry signals, such as pain, from the arms, legs, and the body to the brain. Nerve roots are used to transmit information between the spinal cord and the other parts of the body, such as arms, legs and organs. The cylinder-shaped vertebral body is the weight-bearing structure of the vertebrae. The flat plates of the lamina create the outer wall of the vertebral canal and help protect the spinal cord. The spinal cord sits in this channel formed by the lamina and the vertebral body. Pedicles connect the lamina to the vertebral body. Discs separate the vertebrae. They are made of tough, elastic material that allows the spine to bend and twist naturally. The articular facets are where two neighboring vertebrae attach. The spinous process protrudes from the back of each vertebra. Muscles and ligaments that move and stabilize the vertebrae attach to the spinous processes. Two transverse processes stick out of the sides of each vertebra. Muscles and ligaments that move and stabilize the vertebrae attach to the transverse processes. All of the above elements of the spinal column and vertebrae protect the spinal cord, which provides communication to the brain. The spinal cord also transmits sensation and mobility in the body through interaction of ligaments, bones and muscle structures of the back and its surrounding nerves. The spinal cord ends at the L1 level, where it divides into many different nerve roots that travel to the lower body and legs. This bunch of nerve roots is called the cauda equina, which means "horse's tail."